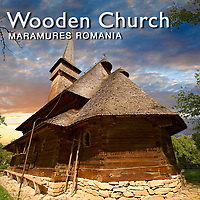 Pictures & Images of the Wooden Churches of Maramures in the Maramures region of northern Transylvania are a group of almost one hundred churches of different architectural solutions from different periods and areas. They are Orthodox and Greco Catholic churches. The wooden churches of the region that still stand were built starting in the 17th century all the way to 19th century. Some were erected on the place of older churches. They are a response to a prohibition by the Catholic Austro Hungarian rulers against the erection of stone non Roman Catholic churches. The interiors of the wooden churches of Maramures are painted with rather "naïve" Biblical scenes, mostly by local painters. The most characteristic features are the tall tower above the entrance and the massive roof that seems to dwarf the main body of the church. The eight churches that are UNESCO World Heritage Sites are outstanding examples of a range of architectural solutions from different periods and areas. They show the variety of designs and craftsmanship adopted in these narrow, high, timber constructions with their characteristic tall, slim clock towers at the western end of the building, either single- or double-roofed and covered by shingles. As such, they are a particular vernacular expression of the cultural landscape of this mountainous area of northern Romania. The Church of the Presentation of the Virgin at the Temple (Bârsana), built in 1720, became a parish church in 1806. A two-level portico, connected by a staircase, was added to the western facade. Because of its plan, the church belongs to the tradition of the Maramure? region, but differs in its smaller size. The Church of Saint Nicholas (Bude?ti) was built in 1643 on the site of a 15th-century church. It is also distinguished by its size and the four pinnacles at the base of the spire, which indicates a link with the neighbouring region of Lapus.